'Trump said barriers turned El Paso from one of the nation’s most dangerous cities to one of its safest, but that’s not true. 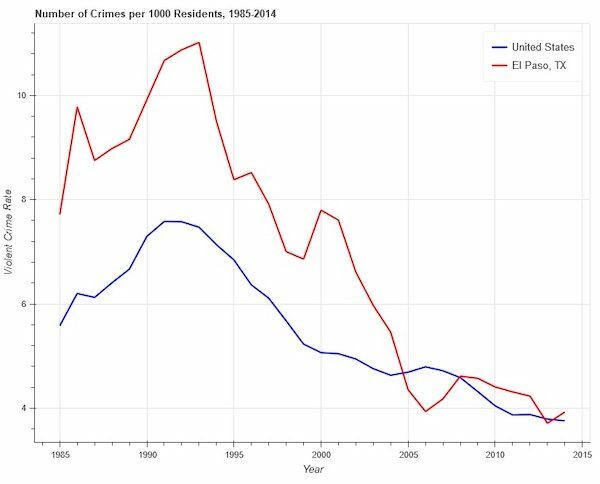 El Paso, population around 800,000, had a murder rate less than half the national average in 2005, a year before the most recent expansion of its border fence.' Trump is lying about the effect the wall has had on violent crime in El Paso & most in the area see right through his desperate bid to fulfill his major campaign promise to build a wall that Mexico would pay for. That's not going to happen either. The Wall is going up and there's not a thing you liberals can do about it but pull your hair out and sob uncontrollably. I'm sure liberals can come up with a new scheme to get more party voters. Perhaps your 'free stuff' campaign. Trump will inspire many academic research projects as professionals try to piece together how he configured and maintained his elaborate fantasy world in spite of access to vast information reserves and many teams trying to help him correct his garbled recollection of facts. Source: FACT CHECK: Was El Paso One of the 'Most Dangerous Cities' in U.S. Before a Border Fence Was Built? Note that the El Paso section of the fence was built 2008-2009. Yup.. they are at the hair on fire running through glass doors stage now. They actually argue that walls don't work? Never mind that the democrats have time after time voted for funding physical barriers. According to Donnie Moscow, the wall has already been built and Mexico's going to pay for it. Ask the men and women on our front line protecting the border! Do you even know what thread you are in? Trump is piling new materials onto old sections of barriers and there might not be a lot we can do about that, though Nogales is trying. But new wall? Yeah, maybe if he's willing to pay through the nose with concessions far righters won't like. So far it's not looking good. Yes, I do, and thanks for asking. Why don't you?